It’s time for our FIRST guest blog post! 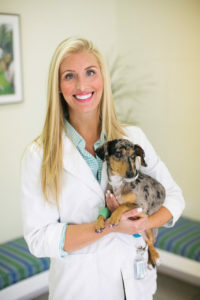 University College of Veterinary Medicine and is an Associate Veterinarian at Lyndon Animal Clinic. She dropped by our blog to offer some sage advice about one of the topics pet owners ask about most: vaccines. Do I Really Need to Vaccinate my Animal? Whether your pet is an adventurer, vacationer, or more of the stay-at-home type, keeping up with your pet’s preventive care is vital to its health. A yearly vaccination protocol plays a key role in ensuring your pet’s health. Pet-friendly places like the groomer, boarding facility, and park tend to have strict vaccine guidelines and for good reason. Believe it or not, yearly vaccinations are not your veterinarian’s road to fast cash, but vaccines are a tool your vet uses to protect your pet from extremely contagious diseases that can potentially be fatal. Distemper/Parvo is recommended to protect your pet from two diseases that are very contagious and can cause serious illness if not death. Rabies protects your dog from being infected by the rabies virus which attacks your dog’s nervous system and eventually leads to fatality. Rabies is fatal to animals and humans. In Kentucky, rabies vaccine is required by law. Bordetella is administered to protect your dog from a highly contagious and infectious form of bronchitis and other respiratory diseases. Although it is not always considered a core vaccine, it is recommended to all dogs with full social calendars. FVRCP protects your cat from multiple serious viruses that range from several respiratory diseases to a fatal bone marrow disease. Rabies protects your cat from being infected by the rabies virus which attacks your cat’s nervous system and eventually leads to fatality. Rabies is fatal to animals and humans. In Kentucky, rabies vaccine is required by law. If you are concerned about your pet being over-vaccinated (and your veterinarian making too much cash), vaccine titers are an excellent alternative. This option allows your veterinarian to determine if your pet needs vaccination boosters for specific diseases based on its antibody numbers. A year-round routine of heartworm, flea, tick and intestinal parasite prevention is also recommended for both dogs and cats. Intestinal parasites and diseases resulting from fleas and ticks are much easier to prevent than to treat. Most pet owners eat, sleep, and share many common surfaces with their pets without realizing parasites can also cause severe illness in humans too. So, monthly prevention is not just for your pet but also for you! If you have questions or would like more details regarding any of these specific topics, feel free to contact myself or any of the other doctors at Lyndon Animal Clinic.